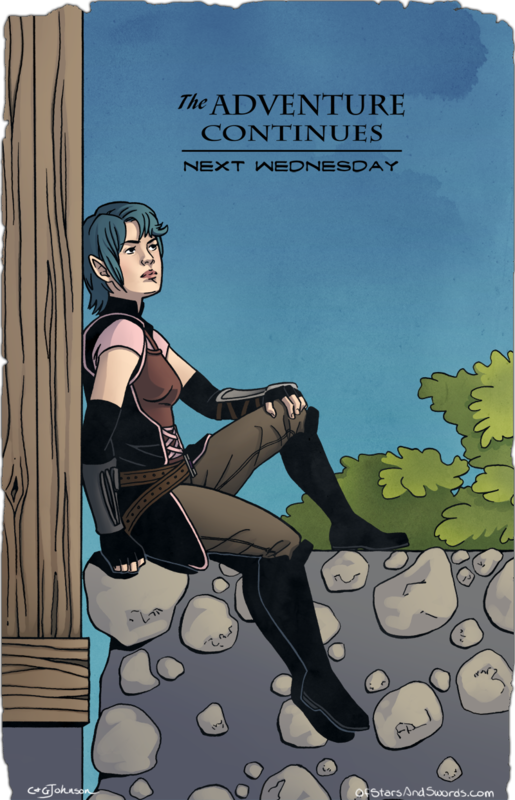 Hello everyone and welcome to our week between issues of the story! But as has been said in the past few weeks here, we weren’t going to just skip this week entirely. So we’ve got a nice little image for you all before the story picks back up next week. Caroline did a few things different with this page in how she colored and I don’t know about you, but with the torn page look on the outlines, I can’t help but see this as a cover to an old Dungeons and Dragons adventure or a pulpy fantasy adventure novel. That is in no way a bad thing, but a happy surprise as this image was never really meant to be a cover at all! Hope this can tide you over for another week! As usual, we’re on twitter and facebook if you’ve got any feedback to throw our way.